Mike Giamellaro, an assistant professor in the MAT program, and the Roundhouse Foundation Faculty Scholar of Science Education. A generous gift to Oregon State University - Cascades will support the creation of an endowed scholar position within the Master of Arts in Teaching program. The position will accelerate the impact of science education research underway at OSU’s Bend campus, create new research avenues, and seed teacher development in K-12 science instruction. The $75,000 gift was made by the Roundhouse Foundation, a Sisters, Ore. based foundation, and establishes the Roundhouse Foundation Faculty Scholar of Science Education. The Roundhouse Foundation supports a broad variety of projects in Central Oregon and rural communities in the Northwest, and has supported the OSU-Cascades campus expansion, its net zero initiative and faculty research. The scholar position was awarded to Michael Giamellaro, an assistant professor in the graduate teaching program. Giamellaro works with fellow researchers and teaching faculty, student teachers and with partners including the High Desert Museum, Central Oregon Community College, local school districts, Central Oregon STEM Hub, and businesses and non-profits to advance how K-12 teachers teach science, technology, engineering and math. 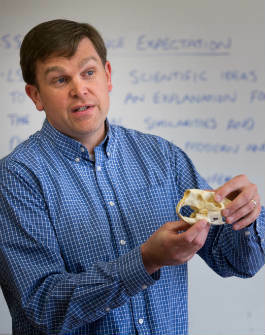 OSU-Cascades’ MAT program offers degrees in elementary and secondary education, with endorsements in multiple subjects, language arts, science, mathematics, and social studies, as well as coursework to support the professional development of teachers. The MAT program is accredited by NCATE, the national standard for teacher preparation. Nearly 500 students have graduated from the teaching licensure program.